An ideal. voltage-controlled voltage source (YCYS) is one whose output voltage V” (I) equals a fixed constant (k) times the value of another, controlling voltage: Vo = kV,; and (2) is independent of the current drawn from it Notice that the constant k is dimensionless. 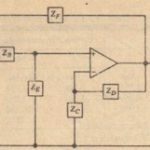 Both the inverting and non inverting configurations of an ideal operational amplifier meet the two criteria. In each case, the output voltage equals a fixed constant (the closed-loop gain, determined by external resistors) times an input voltage. Also, since the output resistance is (ideally ) 0, there is no voltage division at the output and the voltage is independent of load. We have studied these configurations in detail, so we will be content for now with the observation that they do belong to the category of voltage-controlled voltage sources. An ideal, voltage-controlled current source is one that supplies a current whose magnitude (I) equals a fixed constant (k) times the value of an independent. controlling voltage: I” = k Vi; and (2) is independent of the load to which the current is supplied. 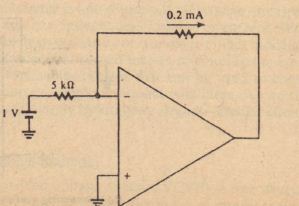 Notice that the constant k has the dimensions of conductance (siemens). Since it relates output current to input voltage, it is called the transconductance, gill, of the source. 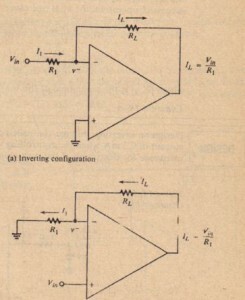 Two familiar amplifier circuits: the inverting and non inverting configurations of an operational amplifier. 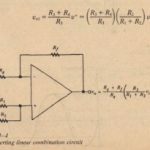 Note, however, that we now regard the feedback resistors as load resistors and designate each by RL• We will show that each circuit behaves as a voltage-controlled current source, where the load current is the current l.. in RI,. 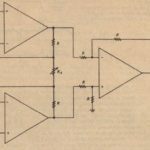 Design an inverting, voltage-controlled current source that will supply a constant \ current of 0.2 mA when the controlling voltage is 1 V. What is the maximum load I resistance for this supply if the maximum amplifier output voltage is :20 V? 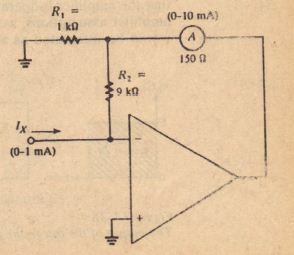 It is desired to measure a de current that r nges from 0 to 1 mA using an cr whose most sensitive range is 0 to 10m . To improve the measurement ai the current to be measured should be amplified by a factor of 10. 2. 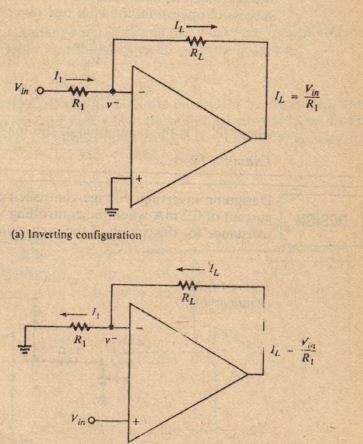 Assuming that the meter resistance is 150 nand the maximum output voltage of the amplifier is 15 V, verify that the: cir uit will perform properly.